LOVE this idea! 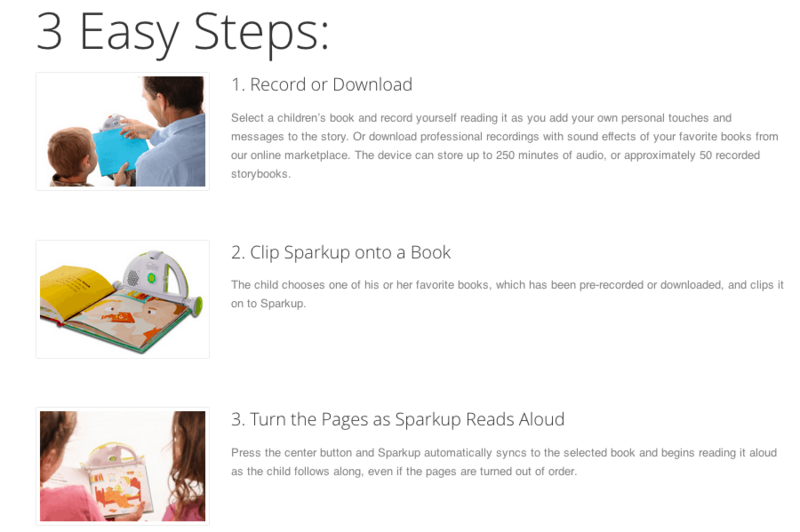 SparkUp allows parents / grandparents and children to record their voices reading any of their favorite books. 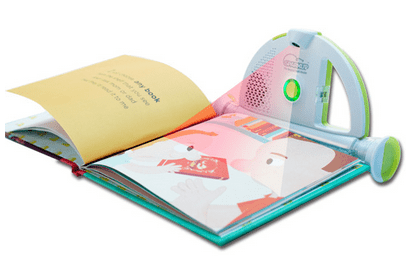 The system holds up to 50 books and you can use any book you own – there’s no limit. Somehow (I want to say magic but I’m pretty sure it’s more about technology), the system registers what page you are on while you are recording and logs it in the system. Then whenever your child turns to that page, SparkUp KNOWS to play your recording from that page. I made a video to show you but I have a confession – I made one little mistake! I mention in the beginning of the video that you can purchase books from SparkUp. That is NOT the case. The book that came with the system was just a tester so the company can show you the possibilities of the reader. So, how does SparkUp work??? What’s coming up for SparkUp?? Hundreds of professional recordings, accompanied by music and sound effects, will be available for download from Sparkup’s website this coming fall. I love this idea for grandparents that live far away, for parents that have to work (or who need a minute to do the dishes!! ), for siblings that want to do something nice for their younger brother / sister. It’s basically for anyone who wants to inspire a love for reading in a child!! Previous Post: « Old Navy Fashion Haul, Anatomy Of An Outfit PLUS A New Haircut (VIDEO) PHEW! I have been exploring for a little bit for any high-quality articles or weblog posts on this kind of area . Exploring in Yahoo I finally stumbled upon this web site. Reading this info So iˇm glad to express that I have a very excellent uncanny feeling I came upon exactly what I needed. I so much certainly will make certain to do not overlook this site and give it a glance on a continuing basis.